Hey batter batter! College baseball is back and things are looking promising for the USC Trojans and UCLA Bruins. The crosstown rivals opened up the 2018 season with series wins at their home fields. USC (2-1) had a rocky start against Utah Valley Friday night. The Trojans came up short with a 1-5 loss but bounced back on Saturday (5-4) and again on Sunday (8-6) to secure the series win. Over in Westwood, the Bruins secured three wins over Portland. Friday night, the Bruins won 7-2 with the help of pitcher Jake Bird throwing six solid innings. Saturday, the Bruins dominated with a 13-0 victory. UCLA had five runs in the eighth inning to push them ahead even further…but the Bruins didn’t stop there! The No. 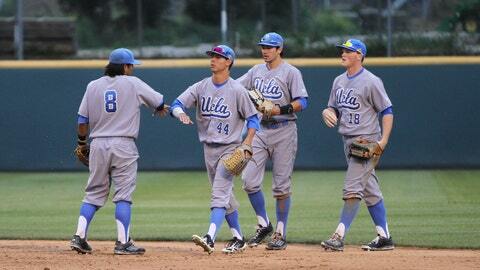 12 Bruins concluded the series on Sunday with a 15-3 win. What’s on deck for both teams? On Tuesday at 6p, USC takes on Long Beach State at Blair Field while UCLA plays Baylor University at Jackie Robinson Stadium. Both LA teams will play against each other for the first time this season on March 11 at the Dodger Stadium College Baseball Classic held at Dodger Stadium.